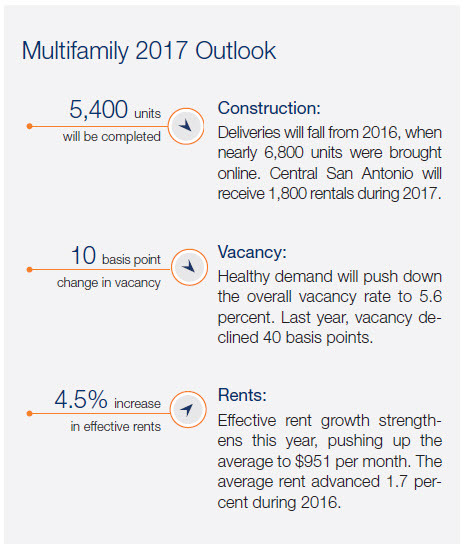 ​​​SAN ANTONIO – Favorable demographic trends and healthy job creation are benefiting local apartment operators, reports Marcus & Millichap in its latest quarterly multifamily market update. The city's population continues to rise at a faster rate than the nation's, especially among 20-to-34-year-olds, the prime renter cohort. "As home prices continue to rise faster than incomes, these individuals will continue to favor apartments over homeownership, placing additional downward pressure on vacancy and encouraging rent gains​," Marcus & Millichap's report said. New apartment construction began 2017 at a slower pace than a year ago, so rental demand remains strong, pushing down the vacancy rate. Much of the demand is occurring in the Class C segment, where vacancy has compressed to 5.5 percent over the last year. Surging Class A completions, meanwhile, have softened vacancy among these assets, pushing up the rate to 9 percent in the first quarter. "The use of concessions to lure tenants to these buildings has increased dramatically in the last four quarters as owners seek to stabilize new properties," according to the report. "Declining deliveries will bode well for these assets this year, allowing demand to catch up with supply. As a result, the metro will experience further tightening in the overall vacancy rate for a third consecutive year."